DigiDop 301 Digital Doppler w/ Rechargeable Battery System. Each DigiDop is equipped with the revolutionary and unprecedented "Digitally Optimized Processing - DOP!" Since the DigiDop is the only digital Doppler on the market, the sounds of fetal heartbeats or vascular blood flow will be louder and clearer than any other Doppler available. The obstetrical probes are extremely comfortable for both practitioner and patient and the vascular probes fit comfortably in the practitioner’s hand. 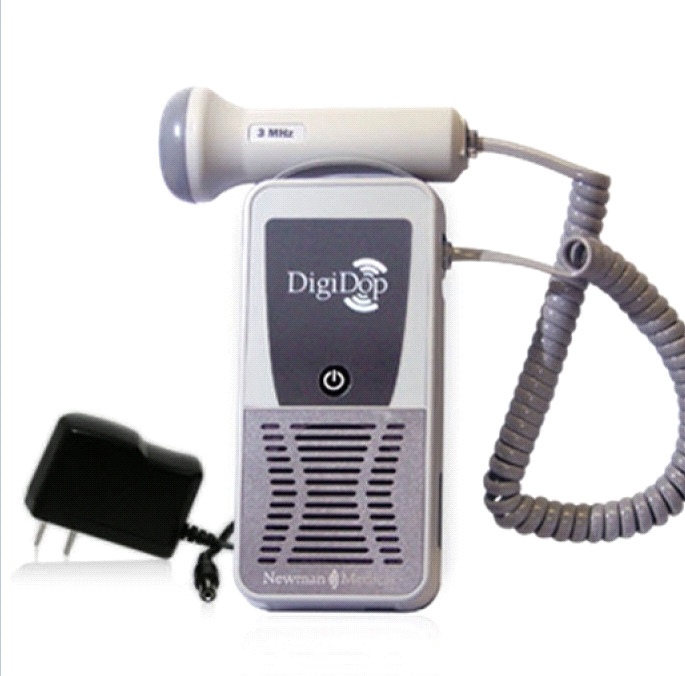 Newman Medical has taken their 30 years of experience and designed the best Doppler ever made! If you have any questions please give us a call (800)355-2956. - ‘Unbreakable’ Magnetic Probe holder won’t break or loosen. - User replaceable cord – unlike competitors you can replace a broken cord. - Rugged Stainless Steel and Polycarbonate Case stands up to years of use. - Go Green! Uses standard AA rechargeable batteries and incorporates auto shut off when not in use. Why the DigiDop sounds so good - it’s the Doppler with DOP: We know that the real key to a great Doppler is performance - sensitivity and sound quality. Therefore, the best part of the new DigiDop is inside - we use digital signal processing (similar to high-end audio equipment) to reduce unwanted background noise and let the Doppler sounds through bright and clear. We call it DOP - Digitally Optimized Processing. To get technical, unlike the Dopplers of our competition, we can change the parameters in the main unit to optimize the sound of each probe – without compromise.